In their book, The Language of Trust: Selling Ideas in a World of Skeptic, authors Michael Maslansky and Scott West make the case that we are living in a "post-trust world" and the advertising and marketing messages of the bourbon-fueled Mad Men era, e.g., "We are better", "We are faster", "We are number one" now fall on doubting ears. People just don't buy unsupported claims any more—saavy consumers just ignore them. However, these self-proclaimed messages are a lot less offensive than the cold calls you get at dinnertime, or the unsolicited sales people who barge into your office (who apparently can't read the red "No Soliciting" sign). 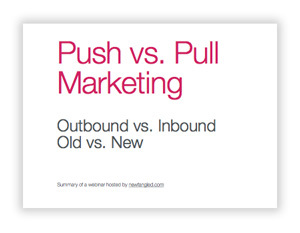 This disruptive way of marketing now has a name: "push," or "outbound" marketing. Is marketing dead? Well, maybe the push variety is, but marketing, in some form, will be around as long as there are things to sell. The big question is: what kind of marketing works in this post trust-era? 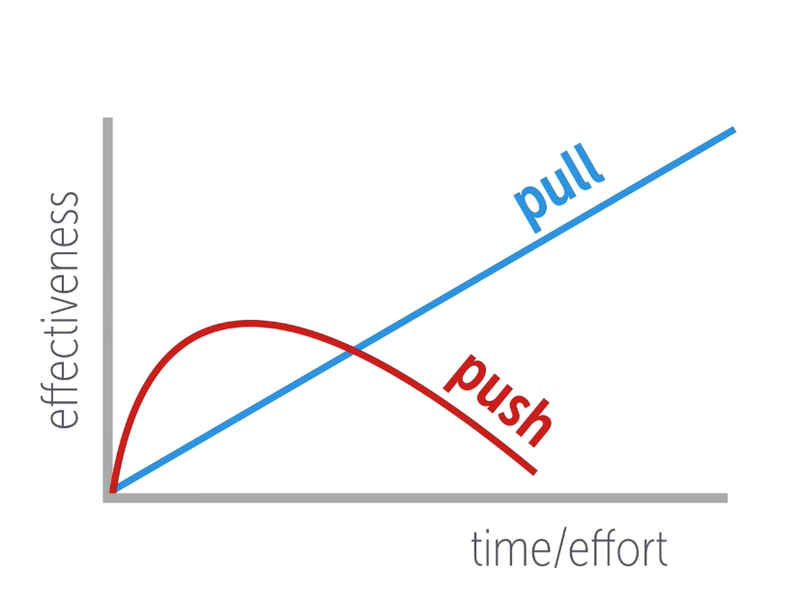 Not surprisingly, the opposite of push marketing is "pull" or inbound" marketing. So instead of pushing your way in front of your audience on your terms, you "pull" them in and wait for them to come to you on their terms. But now you're asking, "why would they come to us?" Well, there is an answer but it's not all that exciting. At first it sounds kind of boring, and then like a whole bunch of work. They come to you because you are giving away something they are looking for: information, news, opinion, data, entertainment, community. And here's the kicker: you give it away, no cost, no obligation. Free for the taking. You give away a little bit of the store, drop your guard, be vulnerable, and tell them what they want to know. This makes you look generous, and also like you know what you are talking about. That builds trust, the Holy Grail of marketing, and something money can't buy. In the end, you become the trusted expert and the person they'll come to when they do want to buy. That's content marketing. How do they find our content? Great question. If we had a definitive answer we'd be a bizillionaires. But let's start with the medium. Here we're are in luck—we have the Web. And it's not called the World Wide Web for nothing. If we only had brochures and prints ads, content marketing would be a lot harder. But the Web is global, timely, instant, and best of all it's searchable. If you are saying the right thing, often enough, in a readable and winsome way, people will find you—and be glad they did. Think about those times you've been searching for something and ended up on someone's blog or website, at an article that gave you exactly what you'd been looking for. It's like finding gold. So my challenge to you: be gold for that person who finds you. A question for you: what do you want your website to say?” Chances are, right now, it’s all about you. And while you’re a pretty great, what does your visitor really want from your site. People today want substance because we know they're not buying the fluff. And believe it or not, you have something say—drawing on your expertise and experience—you just have to mine what is there. No one ever said it would be easy. Reading is hard enough these days, let alone writing. Here are a few tips we've found helpful. Develop a strategy. Think about what kind of information your audience is looking for, who on your team can provide it, and then create a schedule for posting it. Accept the fact that you know stuff, have expertise, and have something to say. Start with something you know so well you can just start blabbing. Make it a daily habit to generate content. Maybe it's in an informative email you wrote 6 months ago; repurpose it as a blog article. Or fire up Evernote on your phone as you head for work and just start dictating about something that's been on your mind. When you get to work you can clean it up and post it. It will get easier and pretty soon you won't be able to turn it off. Plan out the types of media, besides the obvious Web page, to get the message out: blog, email blasts, Twitter, Facebook, even Pinterest and Instagram. All of it should point to the original post. Don't underestimate video and having a YouTube channel. Because it is owned by Google, videos are more quickly incorporated into their search results. Highgate Creative can review your first posts and give you feedback if you are a little tentative. Be patient, it will take a while before your content is indexed and searchable on the Web. It's a numbers game. Marketing is about building trust, especially today. That trust will come by being viewed as the benevolent expert, but that won't happen until you find your voice and start sharing what you know for the good of others. We encourage you to take the leap and start down the road of becoming the pro that will attract new fans of what you have to offer. Go for it. Here is a little slide show that will layout some of the basics of inbound marketing.